SAN JOSE, Calif.--(BUSINESS WIRE)--Jun. 27, 2018-- Cypress Semiconductor Corp. (NASDAQ: CY), the embedded solutions leader, today announced the industry’s first 7-port USB-C hub controller with USB Power Delivery (PD). The programmable EZ-USB® HX3PD hub controller simplifies USB-C dock system designs by integrating the functionality of five chips into one, lowering bill-of-materials (BOM) and reducing board size by as much as 50%. The highly-integrated controller is ideal for notebook and tablet docking stations, monitor docks and multi-function USB-C peripherals. USB-C docks have been complex to design, requiring two USB hubs to support internal and external connections, a dedicated controller for every USB-C port that supports USB PD charging, along with a USB billboard and USB-C bridge controller to report operating status and connection failures. The EZ-USB HX3PD hub controller drastically simplifies system design by integrating the functionality of these chips. Additionally, it reduces footprint with a 12-mm-by-12-mm package. The controller includes a 7-port, 10-Gbps USB 3.1 Gen 2 hub, two USB-C ports with USB PD 3.0 charging, and a dock management controller that supports USB Billboard functionality and secure firmware downloads. The controller’s programmability enables designers to keep pace with changes to the USB-C and USB PD specifications and resolve interoperability issues. The controller also prevents degradation of USB signals by integrating a configurable USB PHY that improves signal quality to meet and exceed USB compliance requirements. More information on the HX3PD solution is available at www.cypress.com/hx3pd. The USB Type-C and Power Delivery standards are gaining rapid support with top-tier electronics manufacturers by enabling slim industrial designs, easy-to-use connectors and cables, and the ability to transmit multiple protocols and deliver up to 100 Watts of power. The USB Type-C standard’s 2.4-mm-high connector plug is significantly smaller than the current 4.5-mm USB Standard-A connector. 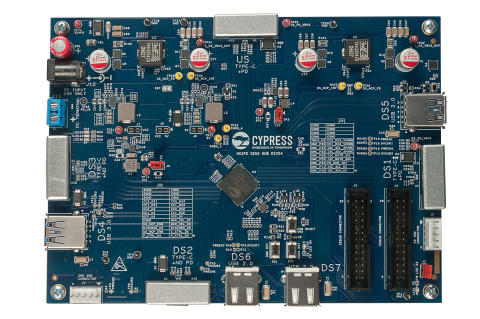 More info on Cypress’ USB-C and Power Delivery solutions is available at www.cypress.com/Type-C.
Join the Cypress Developer Community_3.0, read our blog, follow us on Twitter, Facebook and LinkedIn, and watch Cypress videos on our Video Library or YouTube. Cypress, the Cypress logo and EZ-USB are registered trademarks and EZ-PD is a trademark of Cypress Semiconductor Corp. All other trademarks are property of their owners.